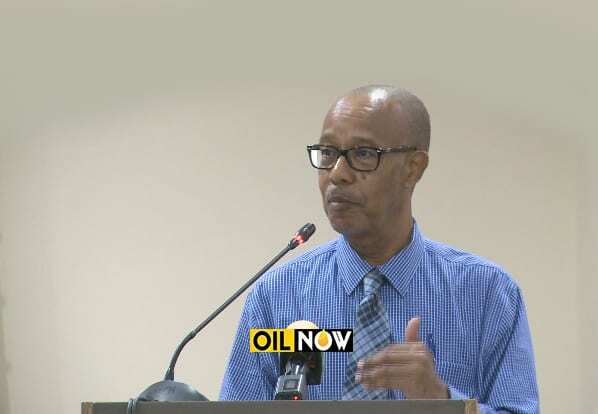 Gordon Harewood, Senior Assistant Registrar (retired) for the Caribbean Examinations Council speaking at a workshop in Georgetown, Guyana on June 13, 2018. Senior Assistant Registrar (retired) for the Caribbean Examinations Council (CXC), Dr. Gordon Harewood, said Guyana is on the verge of exciting times in the history of the country. It is for this reason that he strongly advised that the revision of the school’s curriculum should take into consideration these changing times. He urged the educators to be a part of the change process in moulding the new Guyanese citizen. “We want to see in 2020,” he declared. He explained that, “It is not an opinion, it is a fact Guyana is going to change significantly and we as educators have to be moving with that change and as far as possible ahead of that change and preparing students who are now in nursery school to live in a Guyana where that change is happening every day. Dr. Harewood is part of a team of consultants who are working along with the Ministry of Education to assist with the revision of the school’s curriculum based on leading best practices. Guyana’s school curriculum was last reviewed in the 1990s.